Sean Dyche admits it would be “nice” to spoil Arsene Wenger’s Emirates farewell. 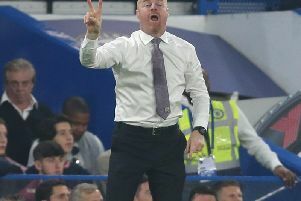 Burnley’s final away game of the season, as they push for European football, has taken on extra significance after the news that the longest-serving current manager in England is to step down at the end of his 22nd season in charge of the Gunners. It would be a big occasion to be a part of in ordinary circumstances. But, as it stands, the Clarets are only two points behind sixth-place Arsenal, who have a game in hand. Sixth place would mean entry direct to the Europa League group stage, with seventh meaning two qualifying rounds before a play-off. And, asked if Burnley can beat Arsenal to sixth, Dyche said: “Easier said than done. The way the season has changed is we’ve been a good story. We were second favourites to go down, then we get a good start by beating Chelsea, we carried that on, it builds and it gets to November and people think we’re had a great start, then we keep it going to Christmas, a few question marks, we’re reverting back to type, but then we have another injection and win five on the trot and we’re on the back of a club like Arsenal. “It’s been a good little story. If we can end it with a win against Arsenal at their place, that would be nice. “But he’s a legend of the game, for all the questions mark, everyone will reflect on his time there. I’ll be amazed if there’s not documentaries about his time there. “To have our little tiny piece of it that in itself a nice moment to be involved in for such a high profile and legendary manager. “We’ll be trying to win, we’ve had a couple of moments where things have gone against us at Arsenal...” as Dyche refers to the last three meetings between the sides which have seen the Gunners win all three with dubious injury time incidents. But he is a big fan of Wenger both in terms of his achievements, and in how he has been in his dealings with Dyche: “He’s always been really open with us to speak to. I’ve heard some times he’s not but with us he’s always been open, he invites us in down there, he’s quite inquisitive about our journey here and how we make the finance work and developing players.